a hint is quite enough. If they ask: How many are the rules of the Way? Answer them: They are six; mystic knowledge, generosity, fidelity, certainty, contemplation, and knowing that Reality is in oneself. If they ask: What is the namaz (ritual worship) of the Way? Answer them: Cooking raw things to bring them to the murshid (spiritual guide). If they ask: What is the ablution (wudu) of the Way? Answer them: Holding on to the robe of the murshid, forsaking all bad habits, becoming endowed with the exemplary qualities, to be always pure in heart. If they ask: What is the fast (sawm) of the Way? Answer them: To abstain from lying and speaking any harmful thing. If they ask: What is the pilgrimage (hajj) of the Way? Answer them: To enter into the heart of the murshid. If they ask: What is the alms (zakat) of the Way? Answer them: It is the poverty of annihilation of the ego. If they ask: What is the utterance of the Oneness of God (kalimat-i tayyibat)? Answer them: To completely affirm the Divine Reality. If they ask: What is your body, your head, your hair, your forehead, the space between your eyebrows, your beauty, your intuitive intelligence, your mind, your word, your soul, your tongue, your heart, your spirit, your body, your shoulders, your hands, your feet, your throat, your blood? Answer them: The body is the earth and the sky, it means Muhammad Ali. The head is the Throne Most High, which is the point of the letter “ba”. The hairs are the trees. The forehead is the Preserved Tablet. The space between the eyebrows is the “Two bows’ length or nearer” (Qur’an 53:9). The face is the Beauty of the Divine Reality. The intuitive intelligence is Gabriel. The mind is Azrail. The soul is Israfil. The blood is Mikail. The word is the word of the Divine Reality. The tongue is Zulfikar, the sword of Ali. The heart is the house of the Divine Reality. The shoulders are Mount Sinai. The hands are the Power of the Divine Reality. The feet are the force of the Divine Reality. If they ask: Where were you? Where will you go? Answer them: In the Shari’ah, I was in the world of Spirit. I was to come from the Divine Reality. I came to the world. In the Tariqat I was in Adam. I was to come to the Three. I came to the Seven. I will go to the Forty. In the Ma’rifat, I was in the Light. I was to come to my father. I came to my mother. I will go to the Light of the Divine Reality. In the Haqiqat, I was in the Light of Ali, the dot of the letter be. I was to come to the letter “ayn”. I came to the letters “lam, alif”. I will go to the letter “ya”. The letter “ya” is the last of the twenty-eight letters. Its two dots are the sign of Muhammad Ali. If it was one dot it could not be known. From the dot the letter came into being. It was to explain the dot. Whereas it became the more lost. The secret of those twenty-eight letters is concealed in the beauty of man, and the perfection of a man is the appearing of Muhammad Ali. And those letters are the signs of the prophets who are the four patron saints, and of the family and children of the Ahli Bayt, and are concealed in the beauty of man. And also in the face of man are the Four Gateways, and the four souls, and the four spirits, and the four worlds, and the four angels, and the four books, and the four letters. All of them make twenty-eight. And the seven black lines, and the fourteen white lines, and the seven hairs of Khalil all together are twenty-eight. They are the sign for the thirty-two letters, and the sign of the two sultans. And all existence is in these thirty-two letters and is known by means of them, and is spoken by means of them. And these thirty-two letters are tied to Muhammad Ali, his family and children. And all of them are present in one man, showing the lines which are in his beauty and written by the hand of the pen of power. First of all, the hair, the two eyebrows, the four eyelashes make seven. They are all in order to find man. Even the rakats, which are in the namaz, explicate man. The namaz is divided into three kinds: The namaz of residence, of travel, and the Friday namaz. The namaz of residence has seventeen rakats in one day; that of travel, eleven; the Friday namaz, fifteen. Adding the residence and travel namaz makes twenty-eight, indicating the twenty-eight letters of the Arabic alphabet. If you add the residence and Friday namaz you get thirty-two, indicating the thirty-two letters of the Persian alphabet. Observe! Since the namaz shows the twenty-eight and thirty-two letters which are in the face of man, know them and prostrate to Man. During the namaz which is said at night the reading of the Qur’an is done aloud because the beauty and perfection of man cannot be seen, whereas in the namaz of the day it is apparent and the Qur’an is recited silently. In this the meaning of night is the darkness of ignorance, and the meaning of day is the light of mystic knowledge. The imam who reads the Qur’an addresses those who are in darkness and says: “0 ye blind! See the Divine Reality. Let me reveal him to you.” For those who are in the light (since it is apparent to them) there is no need to so address them, consequently the Qur’an is read inaudibly. When you stand up in the namaz, an “alif” is formed. In bending (ruku’) behold a “dal” is formed. When you have prostrated, a “mim” takes shape. Open your eyes, they all show man! So, in accordance with this, one must know himself and prostrate before Man in order that you may carry out the command of God. If they ask: Why should one surrender oneself to the murshid and be his servant? Answer them: The murshid extracts his student out of the path of darkness and shows him the way to salvation, and afterward, in his soul going up to the Presence, the spirit being given to him, he causes him to attain to Haqiqat. If they ask: What do the words Shari’at, Tariqat, Ma’rifat, Haqiqat mean? Answer them: Shari’at means to put into effect the provisions of Islam. Tariqat has five letters. The meaning of “ta” is seeking, (talab); the meaning of “ra” is discipline (riyazat); “ya” is the vocative letter of calling on the Divine Reality; “qaf” means contentment (qana’at); “ta” means the surrender of the self (tasallum). Tariqat means seeking for and calling out to the Divine Reality, finally finding Him, obtaining peace and contentment, and surrendering oneself. Ma’rifat also has five letters. “Mim” means mystic knowledge of Allah (ma’rifatullah). “Ya” signifies perfect understanding (akli kâmil) and knowledge of divine providence (ilmi ladun). That is, the meaning of “mim” is Muhammad and of “ya” Ali. They mean to know them. The meaning of “fa” is annihilation of self-consciousness in God (fana fillah). “Ta” means repentance (tawba). Haqiqat also has five letters. “Ha” means discriminating between what is lawful and what is unlawful, (halal wa haram). “Qaf” means endurance, qiyam. “Ya” means helping (yardim) in every way possible a brother of the way (yol). The other “qaf” represents knowing that the Divine Reality is existent in everything (qaim). “Ta” means the forsaking of all that is other than God (tarqi ma siwa). If they ask: What is the building of the Tariqat? Answer them: It is standing firmly in one's profession. The obligation of the Tariqat is sixfold- repentance, endurance, abstinence, piety, contentment, devotional retirement (retreat). If they ask: What is there on your head, your eyebrow, in your eye, your nose, your ear, your mouth, your breast, your hand, your tongue, your waist, and your feet? Answer them: On my head is the ruling crown; in my eyebrow is the Pen of Power; in my eye is the light of sainthood; in my ear is the call of Muhammad; in my nose is the fragrance of paradise: in my mouth is confession of faith; in my breast is the Wise Qur’an; in my hand is the Hand of the Ever-Living; around my waist is the girdle of the right guidance; on my tongue is the affirmation; in my feet is service; to my back is the appointed time of death; before me is own destiny in the life. 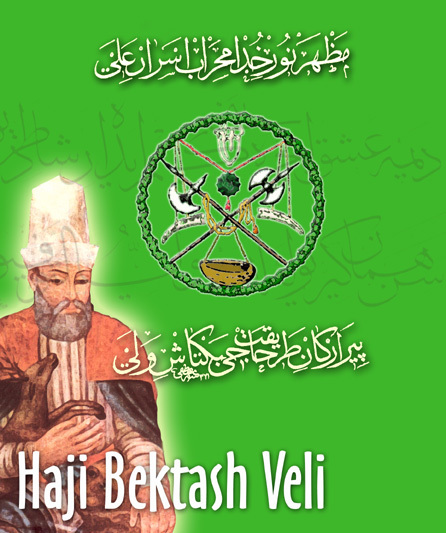 About Bektashi Sufi Order: Bektashism is an Islamic Sufi order (tariqat) that was founded in the 13th century by Saint Hajji Bektash Wali. 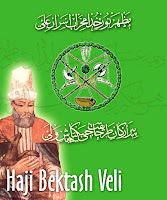 The Bektashi order was greatly influenced during its formative period by both the Hurufi missionary Ali al-'Ala (15th century) as well as the Qalandariyah Sufi movement, which took on many forms in 13th century Anatolia. Bektashism shares much in common with other Islamic mystical movements, such as the need for an experienced spiritual guide - called a baba in Bektashi parlance - as well as the doctrine of the four gates that must be traversed: the Shari'ah (religious law), Tariqah (the spiritual path), Ma'rifah (true knowledge), Haqiqah (reality). Bektashism places much emphasis on the concept of Wahdat-ul-Wujood, the "Unity of Being" that was formulated by Ibn Arabi. According to Anthony Weir "The Sufi Bektashi sect offers the nearest the way of life that Jesus of Galilee led (and hoped his followers would lead) that is institutionally possible for 'Christianity' or Islam in the 21st century." Many of their mystical practices also have deep continuation quality of earlier mystic Christianity. In a sense Bektashi darvishes are Europe's very native Darvishes who follow the Mystical path with their authentic style of devotion, knowledge and wisdom. May Allah preserve and protect the brothers and sister darvishes of Bektashi order and their tekkes around the world. Ya Hafeez!